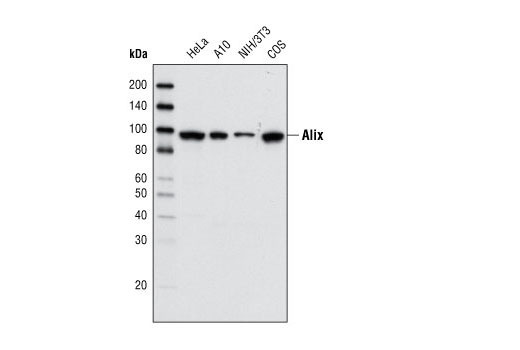 Western blot analysis of cell extracts from various cell types using Alix (3A9) Mouse mAb. Alix (3A9) Mouse mAb detects endogenous levels of total Alix protein. Monoclonal antibody is produced by immunizing animals with full-length recombinant human Alix protein. Alix, a phylogenetically conserved cytosolic scaffold protein, contains an N-terminal Bro1 domain, a coiled-coil region and a C-terminal proline-rich domain (1,2). Originally identified as an ALG-2 (apoptosis-linked gene 2)-interacting protein involved in programmed cell death (3,4), Alix also regulates many other cellular processes, such as endocytic membrane trafficking and cell adhesion through interactions with ESCRT (endosomal sorting complex required for transport) proteins, endophilins, and CIN85 (Cbl-interacting protein of 85 kDa) (5,6). Mattei, S. et al. (2006) Eur. J. Cell Biol. 85, 925-936. Odorizzi, G. (2006) J. Cell Sci. 119, 3025-3032. Vito, P. et al. (1999) J. Biol. Chem. 274, 1533-1540. Missotten, M. et al. (1999) Cell Death Differ. 6, 124-129. Katoh, K. et al. (2003) J Biol Chem 278, 39104-13. Sadoul, R. (2006) Biol Cell 98, 69-77.